The Miscellaneous and Rarely Used parameter sections control various aspects of CopyStorm. Show All Options No No If checked, all CopyStorm options will be displayed. If unchecked, only commonly modified options will be displayed. Compact: Display a single line of text for each table that has copy activity. Summary: Display a single line for each table processed (even if no records were copied). Full: Display a verbose amount of logging information. Debug: Display everything Full displays, plus additional debugging information. Use Apache Logging No No If checked, logging will be performed with the Apache Commons Logging framework. By default, Log4j will be used. Config Directory No By default, CopyStorm will look for configuration file overrides in the directory “config” within the CopyStorm installation directory. If this value is set then CopyStorm will also look in this directory for configuration file overrides. Estimate Total Time No No If checked and CopyStorm is running with a GUI, an extra SELECT query will be issued for each table to determine the total number of records to be copied. Debug Mode No No If checked, CopyStorm will output logging messages to the debug console (normally hidden). 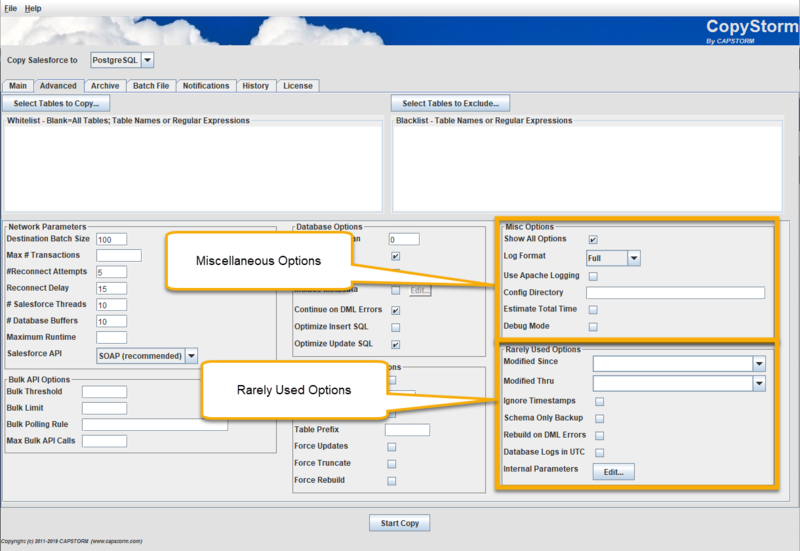 The following options change the normal CopyStorm algorithm for fetching records from Salesforce. Do not use these options for normal incremental updates. CopyStorm normally fetches only records that have been added or modified based on the timestamp data stored in the local database. These options force CopyStorm to fetch all records based on these parameters. When used in conjunction with the “Force Updates” option a corrupted database can be repaired without truncating and reloading. Modified Since No If a date is specified, then only records created or modified on or after the specified date are copied. Built in relative dates are available from a pull-down menu or a fixed date can be entered. When entering a date, the interface will have a yellow background which clears when a date is recognized. Modified Thru No If a date is specified, only records created on or modified on or up to the specified date are copied. See format notes above. Ignore Timestamps No No If checked, CopyStorm will retrieve records in ID order rather than timestamp order. WARNING: unless a CopyStorm job runs to completion without errors, using this option will make subsequent incremental updates fail to fetch the proper records. Rebuild on DML Errors No No If checked, CopyStorm will drop and rebuild a table if an ALTER statement on the table causes a DML exception. Database Logs in UTC No No If checked, timestamps recorded in CopyStorm’s job tracking log tables will be in UTC rather than local time. 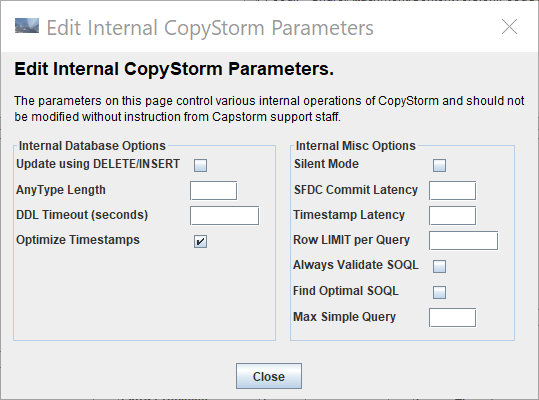 Internal Parameters No Launches a dialog used to modify internal CopyStorm parameters that should not be modified without instructions from Capstorm. Update Using DELETE/INSERT No No If checked then CopyStorm will UPDATE records by first deleting them and the re-inserting them. This option is ignored if the Optimize Update SQL option is checked. AnyType Length 255 No Allocate 255 characters for Salesforce columns using the AnyType data type. Use of an AnyType column is rare and only seen in Salesforce system level tables. DDL Timeout 3600 No Set the number of seconds CopyStorm will wait for a DDL operation to complete. DDL operations, like CREATE INDEX, may take considerably longer than DML operations and thus have their own timeout parameter. Optimize Timestamps Yes No If checked, then use the time of the most recently complete CopyStorm job to reduce the number of records read from Salesforce. If not checked, then the timestamp of the newest record in Salesforce is used to build SOQL queries, and at least one record from each table will always be read. Silent Mode No No If checked, CopyStorm will only display errors to stderr when run in batch mode. SFDC Commit Latency 120 No The number of seconds a Salesforce records has to be unchanged until it can be trusted that records have been written to Salesforce in timestamp order. This is a workaround for Salesforce’s belief in time travel — a record with a timestamp of 12 noon can be written to Salesforce before one with a timestamp of 11:59 m.
Timestamp Latency 2 No When searching for records in Salesforce based on the timestamp of the most recent record in CopyStorm then subtract this number of seconds from the most recent timestamp in Salesforce. Row LIMIT per Query 20000 No The default number of records to read from Salesforce with a single SOQL statement. A larger number may reduce the number of Salesforce API calls slightly but also may result in query time outs that CopyStorm must recover from using additional API calls. Always Validate SOQL No If checked then CopyStorm will validate every generated SOQL statement to insure that a QUERY_TOO_COMPLEX error is not generated. Since CopyStorm dynamically recognizes QUERY_TOO_COMPLEX errors and rewrites queries to avoid them there is little need for this parameter to be set unless the user is a CAPSTORM developer. Find Optimal SOQL No If check then CopyStorm will take extra effort to generate to optimal load balanced SOQL statements when multiple SOQL statement are needed to read a single row from a table. This parameter is for CAPSTORM developers. Max Simple Query No The smallest SOQL query that CopyStorm will assume never will generate a QUERY_TOO_COMPLEX error. This parameter is for CAPSTORM developers.